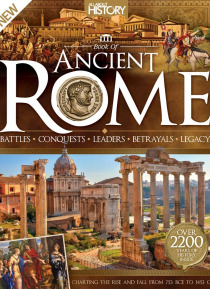 Discover the rise of the Roman Empire from its mythical beginning and mighty battles, the victorious conquests and ruthless rulers, including Julius Caesar and Emperor Augustus, to the empire's inevitable decline and fall. Find out about what life was like in Rome for the rich and poor, the various crimes and punishments, and the vital role of slavery in Rome's economy. The legacy of this vast emp… ire remains with us today, reinforcing the glory of the rule of ancient Rome. Featuring: An emerging empire - From its mythical beginning, find out how Rome rose to Kingdom, Republic and then Empire. Life in ancient Rome - From the Senate to the streets, from luxurious baths to exploited slaves, discover what life was like for the rich and poor. Rulers of Rome - Learn about the many rulers and important players of Rome: merciless Caesar, Mark Antony, Pompey the Great and divine Augustus. The mighty battles - The power and legacy of Rome's army remains today, from Egypt to England.